When you lean in close to hug your pup, ever notice a stale, sour aroma? We love our dogs no matter what, so you might be tempted to wrinkle your nose and write this off. Or maybe, you’ll decide a quick bath is in order. Both reactions, unfortunately, could worsen the problem. As I learned after numerous vet visits with my oh-so-patient Airedale Beethoven, an “eau-de-ear” odor that’s strong enough to grab your attention might signal yeast overgrowth; even a fungal-related ear infection. Don’t you love those sweet, floppy ears on certain terriers and hounds? Unfortunately, that cute flopped-over crease blocks airflow, which can also trap moisture. And guess what loves moisture? Yeast colonies. According to Lee Deaton, founder of Chicago-based canine hydrotherapy facility Natural Healing, pups who enjoy splashing around in the water can experience an even faster dampness buildup when not thoroughly dried. This is why bathing could complicate matters if you notice unpleasant ear odor. When you look inside your canine’s ear — both the inner flap, and around the ear canal itself— do you notice dark, waxy buildup? Dr. Pitcairn notes that this can sometimes suggest a systemic imbalance, such as yeast overgrowth. It may also indicate toxin buildup due to inappropriate diet, environmental cleaners, chemical parasite preventives, and/or excessive vaccinations. What dog doesn’t adore the great outdoors? Unfortunately, rolling and romping around can lead to dirt and grime buildup just inside the ear flap. So remember that if the inner flap looks grubby, it could be harboring bacteria … even camouflaging tiny ticks. 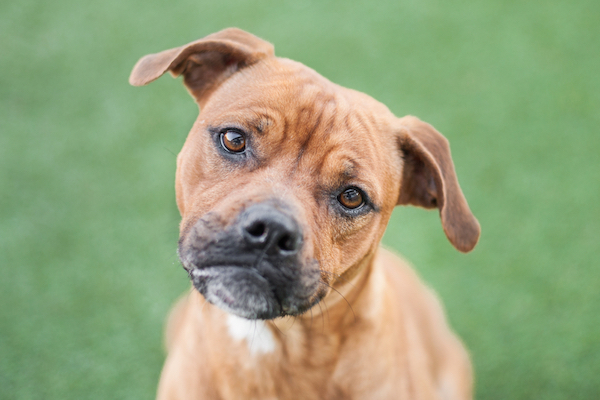 Boxer-mix puppy tilting his head by Shutterstock. According to veterinarian Dr. Karen Becker, food allergies can often show up as “ear-itation” long before you notice actual digestive distress. Does the skin inside each ear have an angry reddish-pink hue? Notice scaliness, even discharge? If your pup shakes his head constantly, or holds it to one side, that’s often a telltale sign of ear discomfort. Commercial kibble is often excessively processed, and it can be extremely high in carbohydrates. Dr. Becker notes that dogs don’t actually require carbs in their diet. So if your dog is prone to yeast overgrowth, carb-loading can propel the problem into overdrive. See if ear troubles slowly improve when you try grain-free, whole-food based brands like Zignature, Evangers, Nutrisca, and Tiki Dog; or a reputable raw brand like Stella & Chewy’s. Canine bodies, just like human bodies, can react to an environmental overload of toxins. So if skin inside your pup’s ears appears angry-looking, go beyond diet factors to consider how many household cleaners, sprays, and detergents you use. Then ask yourself how many vaccinations your pup has had in the past several months. You can switch product brands and investigate three-year vaccines to help lessen this overall load. When it comes to chronically itchy or “aromatic” ears, I’m a hugely devoted fan of Zymox ear care products. These antibiotic-free solutions contain three specific enzymes that have an antibacterial/antifungal/antiviral effect. You simply apply them once per day, and let the targeted trio do its thing. Because they’re enzyme-based, the products are also reassuringly safe if you pup happens to lick away any residual liquid. 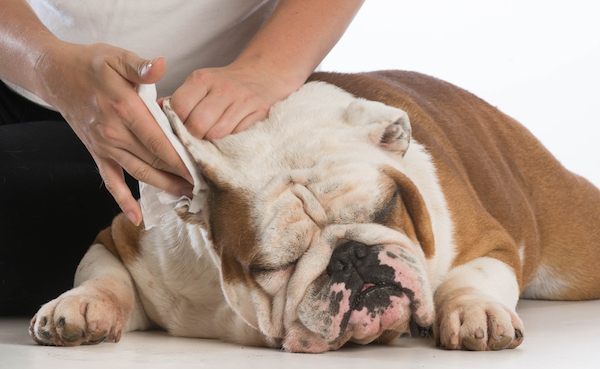 Woman cleaning Bulldog’s ears by Shutterstock. Here’s a natural cleansing protocol that helped ease Beethoven’s chronic ear discomfort. Every day, try dampening a small piece of gauze with Witch Hazel and gently swabbing the inner-ear rim area. Then, add just a drop of pure safflower or grapeseed oil to the very edge of the ear canal. Administer a friendly ear rub to distribute, forming a gentle barrier against buildup. Do your dog’s ears seem excessively irritated? First, visit your vet to rule out a bacterial infection. If itchiness is the only issue, you can make a mildly antiseptic botanical solution using three drops of Bach Rescue Remedy plus two drops of tea tree oil. Using clean gauze, swab the inner ears once or twice per day. Does your dog experience chronic ear issues? What treatments and remedies have helped resolve the problem? Share your insights! The post 5 Natural Ways to Treat Your Dog’s Ear Problems appeared first on Dogster.